Provenance markings that proved that these books belonged to Carl Neuberg. 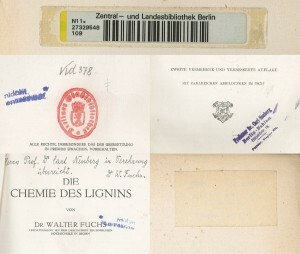 In the lower right hand corner, a piece of paper has been pasted over Neuberg’s name and address. In 2013 the Central and Regional Library of Berlin (Zentral- und Landesbibliothek Berlin, ZLB) restituted 40 volumes (representing 39 titles) from Carl Neuberg’s former library as part of their search for books looted and expropriated by Nazis (NS-Raubgutforschung) among their collections. 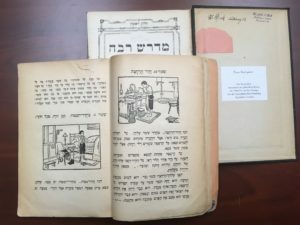 The books were returned to the granddaughters of Carl Neuberg who decided to transfer them to the library of the Leo Baeck Institute in New York. The books are mainly scientific literature with provenance marks such as autographs, name- and address stamps, annotations or dedications. When Neuberg fled in 1939 to the United States his abandoned property was packed in crates and stored, including his library. A part of it was presumably lost as a result of war damage; another part of Neuberg’s possessions was looted by the Gestapo in 1941 and sold in 1944 at a public auction. 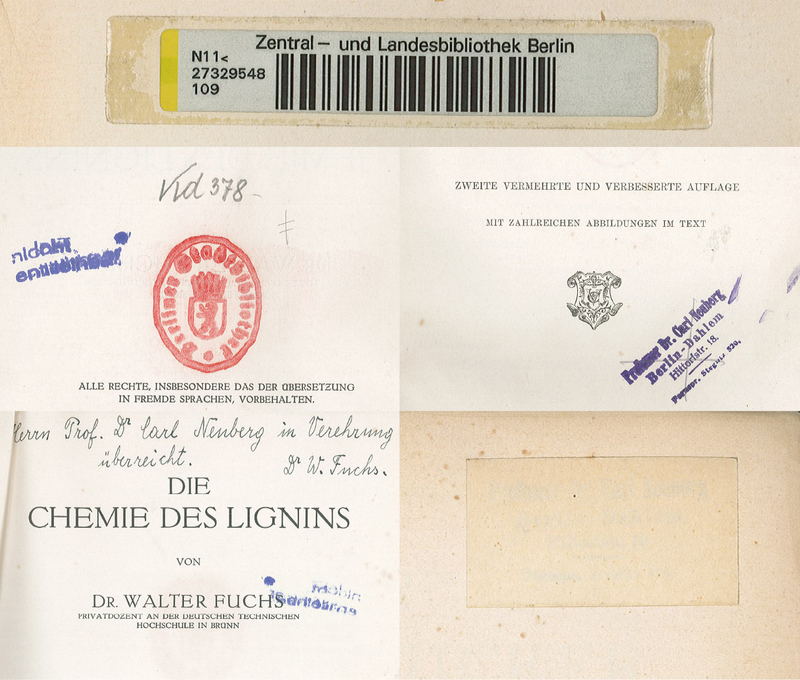 It is, however, uncertain exactly when the books entered into the possession of the Berliner Stadtbibliothek, incorporated into the ZLB in 1995; what is certain is that many of them appear in accession journals of 1945-1946, listed as “gifts.” The researchers from the NS-Raubgutforschung Division of the ZLB postulate that Neuberg’s books entered the holdings of the Berliner Stadtbibliothek in 1943 as part of an acquisition of 40000 books from the Berliner Pfandleihanstalt (Municipal Pawn Shop) which were looted from deported Jews, although the evidence is insufficient to confirm this matter. The owner stamp in the upper left corner reveals that this popular Torah translation belonged to Felix Halberstadt. On November 27, 2015 representatives of the State and University Library Hamburg transferred a book that was previously owned by Felix Halberstadt to the Leo Baeck Institute New York, as part of their efforts to restitute books that were looted during the Third Reich. Felix Halberstadt (1877-1942) was a sales agent for textiles in Hamburg. He lived a religious life and took an active part in various Jewish organizations including the Burial Society of Hamburg. Felix Halberstadt and his second wife Josebeth were deported on December 6, 1941 together with Hamburg’s prominent Rabbi Joseph Carlebach and his family who lived in the same apartment house at Hallerstrasse 76. They were all shot near Riga on March 26, 1942. The Gestapo confiscated his belongings like that of other deported or emigrated Jews. 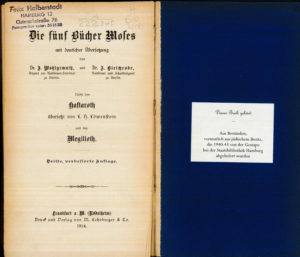 The book that was identified, a German translation of the Pentateuch, was handed to the State and University Library Hamburg by the Gestapo in 1943. Felix Halberstadt’s son Helmuth Halberstadt (1911-2003) was able to emigrate with his wife Jenny Heckscher to the United States via London in March 1939. In America, they changed their names to Howard and Jenny Hall. Their estate has been deposited with the Leo Baeck Institute New York as the “Howard and Jenny Hall Collection” and includes extensive correspondence between 1939 and 1941 documenting their efforts to bring family members from Germany to the United States. Felix Halberstadt was related to the well-known photographer Max Halberstadt from Hamburg who decided to transfer the book to the Leo Baeck Institute in order to connect it with the family papers.